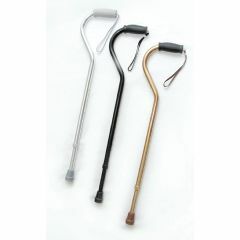 Adjustable height from 31" to 40"
The Offset Handle Cane with Strap features an anodized aluminum finish with a Hypolan hand grip. Adjustable height from 31" to 40" in 1 " increments. Short Distances. Indoors. Long Distances. Outdoors. Wet Weather. Supports Weight. Short enough for me. Outdoors. Long Distances. Indoors. Short Distances. Elderly. Long Term User. Rheumatoid Arthritis. Bad bach. Bad back. Since I am a short heavyweight , this enables me to lean on it with all my weight with no problems. It is helping me to get more mobile as I heal. Excellent cane at a great price. Need an offset Cane That Height Extension is 40" to 44". Do you have some?